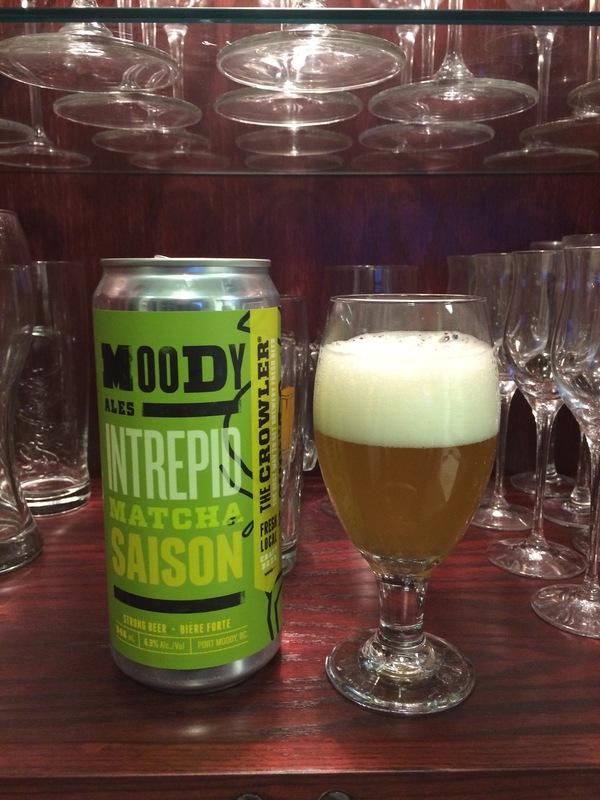 Port Moody’s Moody Ales brings us their Guest Brewer Series: Steve Sheldon’s Intrepid Matcha Saison. For their own blog post on it check here. The look of the beer is great. Green beer not on St Patrick’s Day? Yes, please. It seriously looks like a nice cup of matcha mixed with beer, the green is exactly right but thinned by the saison yellow. Not super cloudy but enough to make me think saison or matcha with a nice, light carbonation visible. The head is foamy and aggressive and a clean white. As the head comes down the green of the beer comes into it. The aromas are clean and refreshing. Matcha dominates married with a nice musty funk from the saison base. Some light, fruity notes, mostly orange and lemon, are in there as well. The flavours are perfect. There is a refreshing pilsner quality to the malt taste and the bitterness of the matcha compliments fruity bitterness of the hops. The tea flavour comes right through but it doesn’t over power anything and adds a nice complexity to the beer. There is a subtle hint of lemon that adds a nice little tartness. The mouthfeel is creamy and it goes down easy while sitting on a balcony. I taste the green tea, the funky saison and the hops, they are all balanced and none overwhelm the others. This beer would be excellent with watermelon on the beach or sushi. This entry was posted in Saison and tagged bc, canada, craft beer, matcha saison, matcha tea, moody ales, port moody, saison.